The printed version was launched on 4th May 2018 in Graz, during the event organized by FH JOANNEUM included in the programme of the Festival Design Month. The book “Investigation” is a collaborative research work, made from more than 80 case studies collected by the partners in Europe. They tell about actions led by creative citizens to transform their urban environment. 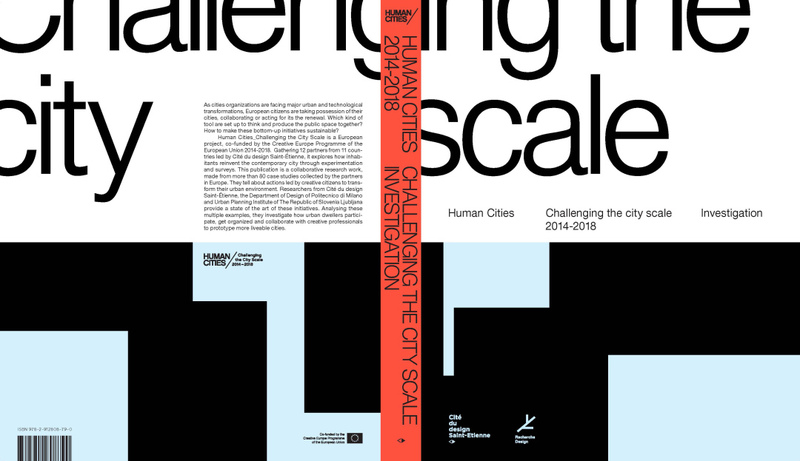 Researchers from Cité du design Saint-Étienne, the Department of Design of Politecnico di Milano and Urban Planning Institute of The Republic of Slovenia Ljubljana provide a state of the art of these initiatives. Analysing these multiple examples, they investigate how urban dwellers participate, get organized and collaborate with creative professionals to prototype more liveable cities. This scientific work published by Cité du design Saint-Étienne is addressed to researchers, practitioners, but also developers or creative citizens. The first part “State of the Art” is an illustrated analysis of the experimental, frequently bottom-up initiatives collected by all the partners in European countries, written by the partners of Saint-Etienne, Ljubljana and Milan. The second part gives a larger space to each partners’ specificity, making a focus on one case or one specific topic developed by each city. It is both an object of Design research and an incentive to develop experimental and collaborative projects of urban transformation. A second book – addressed to a more general audience – will be released in September 2018 and presented in Tallinn during the Desainiöö festival.